National Security Decision Memorandum 13 for the reversion of Okinawa, a top-secret file that summarized U.S. policy on the negotiation with Japan for the reversion of Okinawa to Japanese sovereignty. May 13, 2012　Hideki Matsudo of Ryukyu Shimpo reports from Washington D.C.
On May 11, in Washington D.C., former U.S. Government senior official Morton Halperin, who in the past was responsible for negotiating with the Japanese Government on matters relating to the reversion of Okinawa to Japanese sovereignty, responded to a request from the Ryukyu Shimpo for an interview. Four decades ago, he drafted the National Security Decision Memorandum 13 (NSDM 13), a top-secret file that summarized U.S. policy on the negotiations with Japan the reversion of Okinawa, which the governments worked out on May 15, 1972. Halperin said that he let people in the Japanese Government know that the U.S. Government was open to considering reversion, and the Japanese Government could come out and say that reversion was necessary. He looks back on that day as the best of his career. Former senior official Morton Halperin in Washington D.C., May 10. Halperin suggested that the Japanese Government had followed the United States’ lead in its security policy, and that the attitude of the Japanese Government did not seem to have changed. He said, “I think they both have to take account of the political desires of the Okinawan people and recognize that security policy always has to be determined in the context of the domestic politics of the countries involved, and that you don’t just make security decisions.” He also stressed the necessity of reviewing the bases that “the people on Okinawa do not want,” because it is an excessive burden to them. In the NSDM 13 that he drafted and Henry A. Kissinger, the aide in charge of national-security issues for President Nixon, signed, the U.S. Government clearly expressed the desire for maximum free use of the military bases in Okinawa. This provided the premise for the Japan-U.S. Joint Committee Agreement known as the “5.15 memo,” which set the conditions for the use of U.S. military bases when Okinawa returned to Japanese sovereignty in 1972. Based on the 5.15 memo that still holds sway, the two governments concentrate 74% of U.S. military exclusive-use facilities in Okinawa Prefecture, which is just 0.6% area of Japan. The former senior official stated, “Well at the time we were writing this it was particularly important because there was a war going on in Vietnam and all of Indo-China. I think it’s long past. Reversion occurred many years ago and yet there has been a failure, I think, of both governments to follow up to shrink the bases in Okinawa, the way they’ve been shrinking in Japan.” He suggested there was discriminatory policy against Okinawa between the main islands in the process of reducing the burden of the U.S. bases because the reduction of U.S. military bases has not progressed in Okinawa. 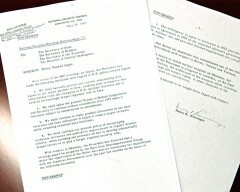 With regard to the secret agreement on nuclear weapons during U.S.-Japan Okinawa Reversion Negotiations in 1969, Halperin commented, “Not retaining, but the right to return them [in the case of a contingency].” Kei Wakaizumi, a secret envoy of the Prime Minister Eisaku Sato, wrote the inside story about the secret negotiation from Japanese side in his book “Tasaku Nakarishi o Shinzemu to Hossu” (The Best Course Available), published in 1994. The late professor of Kyoto Sangyo University was a negotiating partner of Halperin.